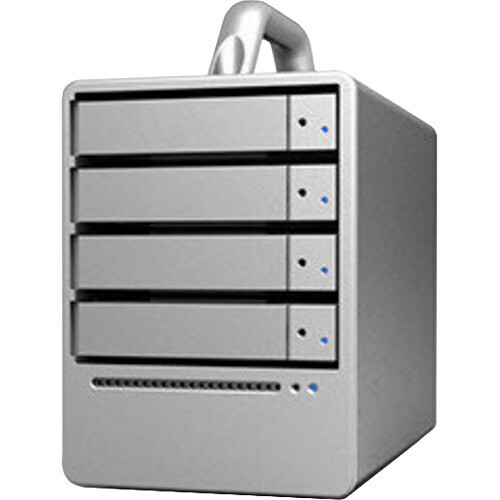 The SOHOTANK 4-Bay miniSAS RAID Enclosure from Stardom provides you with four 2.5" or 3.5" SATA III bays for hard drives or solid-state drives in a JBOD configuration. With JBOD, or otherwise known as "Just a Bunch of Disks", each drive is independently accessible so you'll be able to utilize their large storage capacity to your needs. Secure your drives into the drive modules using the included mounting hardware and insert them properly to prevent them from being accidentally removed. Once installed, connect this enclosure to your system via miniSAS for speeds of up to 6 Gb/s. JBOD, or otherwise known as "Just a Bunch of Disks" lists your drives as independently accessible disks so you'll be able to utilize their large capacity for your needs. Included with this unit is a handle that you can install yourself in order to easily carry it from job to job. Featuring a full aluminum body and a built-in fan, this enclosure can efficiently cool your installed drives, keeping them cool and operational. Box Dimensions (LxWxH) 13.3 x 9.3 x 9.0"